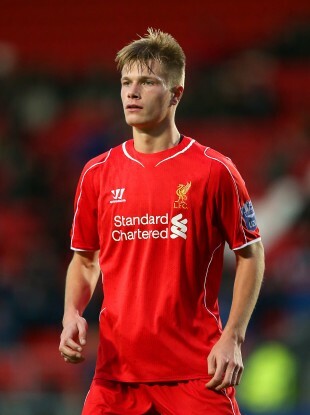 Daniel Cleary has been a regular for Liverpool at youth level. LIVERPOOL ARE EXPECTED to opt for youth rather than experience for this Thursday’s Europa League clash with Bordeaux, and Irish teenager Daniel Cleary could be one of the beneficiaries. The Liverpool Echo reports that big names such as Christian Benteke and James Milner have been left out of the squad, while 19-year-old Cleary is understood to have made the trip. Cleary is a centre-back who can also play as a right-back and he has been at the club’s Academy on and off since the age of 11. Liverpool’s official website describes him as an “aggressive defender” and “a gifted ball player” who “can carry possession from the back to help open up pockets of space for his teammates to exploit”. Cleary has been a regular in Liverpool’s U21 squad of late and featured in the senior team’s pre-season tour, making his debut in a friendly against a Malaysia XI in Kuala Lumpur. He officially signed for the club in 2011 from Crumlin United. Cleary has played for Ireland at U15, U17 and U19 level, featuring in European Championship qualifiers for the latter. Should Cleary feature tomorrow night, he would be the first Irish-born player to play competitively for Liverpool since Robbie Keane’s departure and the first Irish-born player to come through the youth ranks at Anfield since Richie Partridge. The youngster is highly thought of at the club and was given the chance to train with the first team last year. Email “All you need to know about the Irish teenager included in Liverpool's Europa League squad ”. Feedback on “All you need to know about the Irish teenager included in Liverpool's Europa League squad ”.